This has become my “go-to” dessert for work. It is CHOCOLATE. Need I say more? Probably not, but I will anyway. It is healthy too. Yes, chocolate and healthy. But I am not going to seduce you into thinking this Chocolate Cherry Energy Bite recipe is low fat too. Because it’s not. Sorry….. These gluten-free energy bites have a lot of almond butter and that contains a lot of fat. However, it is mostly good fat. The almond butter I use has 18 grams of fat, but only 1.5 of that is saturated. So, if you can deal with that, then these are the perfect little boosts of energy. You could even have them for a healthy morning snack. Fortunately, these protein bites also make an excellent afternoon snack! But the even more excellent thing about them is that they are NO BAKE. And they are quick to prepare, catapulting them into the perfect summer chocolate dessert or snack category, especially for those of us without A/C (that’s air conditioning to anyone that is not from Manitoba and eastwards). 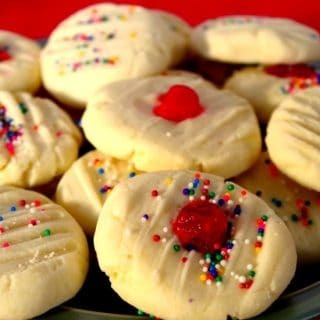 But they really are a great healthy treat all year ’round! These energy balls satisfy the sweet tooth to the point that if I pack them for work, I am finding that I don’t even need to fret about whether I have emergency chocolate in my desk drawer. And I feel less guilty about eating chocolate , which is always a good thing. Maybe it’s the chia? Chia just makes everything feel that much healthier. So, if you are looking for a healthy chocolate snack or dessert, you’ve come to the right place! Looking for other healthy chocolate desserts? 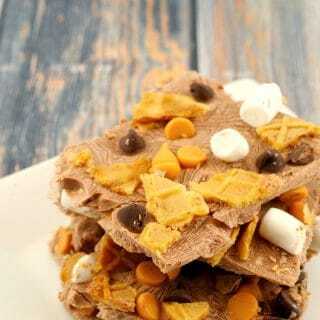 Give my Rocky Road Froyo Bark Recipe a try! 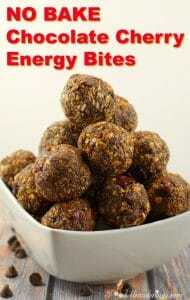 No bake and healthy, these chocolate cherry energy bites are the perfect guilt-free and healthy chocolate snack or dessert! In a large mixing bowl, mix almond butter, agave, vanilla and cocoa powder together. Add 1 tbsp of warm water. Add oats, coconut, chia and chocolate chips and stir until evenly coated. Add dried cherries. At this point, if mixture still doesn't stick together, add water as needed. Transfer mixture to refrigerator to chill until nearly set and easier to handle. Lay parchment paper on a cookie sheet. Remove mixture from refrigerator and shape into 1- 1 1/2 -inch balls and space apart on cookie sheet. ** I find it helpful to wet my hands when I am forming the mixture into balls. Then transfer to freezer bag to store ( I store in freezer for up to 2 months). Thaw when ready to eat (you can pop them in the microwave for 10- 15 seconds) OR throw them in a lunch bag in the morning and they'll be ready to eat by lunch time! I agree, Sue! But I know myself and AM chocolate can only lead to trouble! However, it’s my perfect lunch dessert and PM snack. I admire your will power! I like healthy snacks like these, but that still satisfy my sweet cravings. Love the ingredients and yes, the almond butter is a good fat!